What surprised me most my first few days walking around the city? The most obvious thing – the cell phones. We had no reception as yet up on my mountain, and down in Athena, where they do have it, I’d rarely see people striding the streets talking uninhibitedly into their phones. I remembered a New York when the only people walking up Broadway seemingly talking to themselves were crazy. What had happened in these ten years fo there suddenly to be so much to say – so much so pressing that it couldn’t wait to be said? Everywhere I walked, somebody was approaching me talking on a phone and someone was behind me talking on a phone. Inside the cars, the driver were on the phone. When I took a taxi, the cabbie was on the phone. For one who frequently went without talking to anyone for days at a time, I had to wonder what that had previously held them up had collapsed in people to make incessant talking into a telephone preferable to walking about under no one’s surveillance, momentarily solitary, assimilating the streets through one’s animal senses and thinking the myriad thoughts that the activities of a city inspire. For me it made the streets appear comic and the people ridiculous. Nathan Zuckerman is man in the twilight years of his life. As an author, words and ideas have been his medium to work and creation, yet, now age seventy-one, senility and his growing “word salad” difficulty has begun is slowly robbing him of his ability to write. Once virile and in control of his destiny, a prostectomy has rendered him impotent and incontinent. And, after ten years of New England solitude, the hope of regaining some bladder control from a medical procedure has brought him back to the cosmopolis of his exodus, New York City, where he likens himself to Rip Van Winkle, returning from his twenty-year nap and finding the entire world changed. In his week-long stay, he makes connections with three people who that threaten to irreversibly alter his chosen isolation and reality. With the first, he makes a rash decision to answer an add to swap homes and meets the young and seductive, Jamie Logan, who inspires a fantasy affair in Zuckerman’s mind and reawakens his all-but-lost desire for female company. His second, the serendipitous running into of Amy Bellette, the mistress of his literary icon, Manny Lonoff, reminds him of both his youthful past and his ever-creeping mortality. The third connection he makes is with Richard Kliman, an abrasive, tenacious wanna-be literateur, who believes he has discovered Lonoff’s “great secret” and wants to write his biography, exposing the author’s shameful “crime” in the titillating tell-all fashion of the modern biography, a genre of current writing that is more Weekly World News than World News. Meeting these three people force Zuckerman to face and accept the realities that his isolation has allowed him to ignore: He is getting old, each day bringing him closer to his own life’s end, and after his death he will no longer have control of that life he lived, as some young writer wanting to make a name for himself may decide to write the expose of Nathan Zuckerman. In the end, he asks himself this questions: Once I am dead, who can protect the story of my life? How will I have failed to be the model human? What will be my great, unseemly secret? 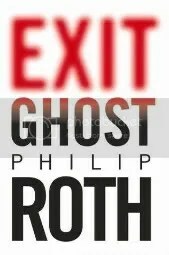 Exit Ghost is my first experience reading Philip Roth, but I don’t plan on making it my last. Slow going at first, I wasn’t sure I would really be able to get into it. How can a mid-thirties, single mom understand and relate to a septuagenarian man? How can I, a moderate to conservative Republican from the mid-west, relate to a liberal Democrat New Englander? I’m a product of the Eighties and Nineties, he is a product of the fifties and sixties. I’m a W.A.S.P. and he a Jew. I am in the Summer of my life when all my body parts are where the good Lord put them, and work within normal parameters. He is entering the Winter of his, incontinent, showing the beginning of dementia, with a mutinous body. I’m aware death will someday happen, though not many I know have experienced it. Zuckerman is facing it’s certainty, many of his friends and contemporaries having already passed through that gate. However, for all this lack of commonality, Roth manages the miraculous; for a time, a young woman in her prime became an aging man in his decline. Winner of several prestigious awards, Philip Roth is a skilled, intelligent yet readable, wordsmith. He references Joseph Conrad (an author I have not yet read, but I do have Heart of Darknesson Mt. TBR) often in Exit Ghost, and I found his writing style to be reminiscent of Faulkner (not surprisingly, he has won the PEN/Faulkner Award three times). For it’s ability to transport the reader to a life completely foreign and unimaginable, as well as for it’s well-written and memorable passages that are sure to be included in quotable literature books, I give Exit Ghost by Philip Roth five out of five stars. Congrats to Amy on winning a copy of Matrimony! After a two week interruption in my home internet service, an interruption that forced me to suffer the limitted resources of the library’s computer (though it’s wonderful that we have such access in our town), I am finally back online at home. !! \O/ YaY \O/ !! 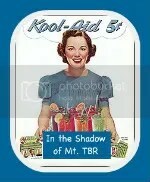 So now, belatedly, I will announce the winner of Mt. TBR’s drawing for a personalized, autographed copy of Matrimony by Joshua Henkin. Thank you, everyone, for visiting Mt. 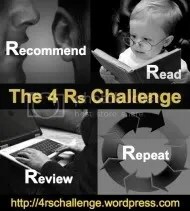 TBR and be sure to come back!